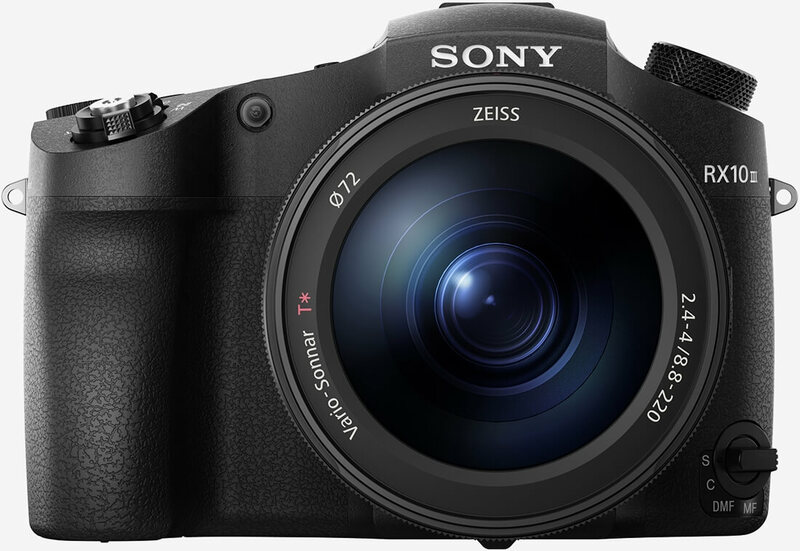 Sony on Tuesday announced an updated version of its popular superzoom camera. The new Cyber-shot RX10 III offers a three-fold increase in zoom length albeit with some compromises. The RX10 III features a 25x super-telephoto lens with an equivalent focal range of 24-600mm, far more reach than the previous model’s 24-200mm range. The tradeoff, however, is that Sony had to ditch the constant f/2.8 aperture and instead opt for a variable f/2.4 – 4.0 aperture. Sony says the lens features eight ED glass elements – one super ED glass element, five ED glass elements and two ED aspherical lenses – and is equipped with Optical SteadyShot image stabilization. When active, it compensates for roughly 4.5 stops of exposure. Lens aside, the camera is pretty much identical to the previous iteration. It features the same back-illuminated 20.1 MP 1.0-type stacked CMOS sensor and BIONZ X image processing engine that offers a sensitivity range of ISO 64 to ISO 12,800 and DRAM chip found on the RX10 II. Together, they allow the camera to shoot at 14 frames per second with minimal blackout and shoot slow motion video at up to 960 frames per second. What's more, the camera is capable of reaching shutter speeds as fast as 1/32,000th of a second. The electronic shutter, meanwhile, allows photographers to capture quietly without disturbing the subject. Wi-Fi and NFC come standard as well. Sony’s Cyber-shot RX10 III goes on sale in May and will set buyers back around $1,500, the company said. Two years from now your smartphones built in snapper will have similar specs and performance and will only leave a $600 dent in your pocket. I already have a 20mp sensor (albeit not the backlit variety) in my smartphone thanks to Sony but the 24-600mm equivalent optical zoom focal range is never going to be in your smartphone unless the laws of physics change. And yet it still hasn't eclipse the quality you can get out of medium format film, even in two years I don't see smart phones getting that much better, you can tweak the image with all the digital magic you want, a small lens camera is always going to be a small lens camera. I still prefer my point and shoot Canon from several years ago over the "laser auto focus" tom foolery of my G3, although I do find it takes surprisingly good images, especially side by side with some of my friends phones. It's not about megapixels. APS-C and full-frame sensors used on proper cameras are a LOT larger than the absolutely tiny smartphone sensors, with vastly higher light sensitivity and much higher dynamic range, among other smaller things (like less inter-pixel interference). No smartphone sensor comes close to even point-and-shooters in this aspect, let alone SLRs. Thinking megapixel count has any relationship with the quality of images a sensor is a huge mistake. Yup, I'm aware of this. My Sony Z3 is only 1/2.3" size sensor and the RX10III is a 1" sensor, and my Sony A7 has a full frame sensor that is massive in comparison to both. I know it's not all about megapixels, but with each generation or two manufacturers are squeezing larger sensors into smartphones, for example take the Panasonic CS1 camera smartphone with a 1" 20MP sensor. It's not impossible to put larger sensors into smartphones but it's pretty impossible to put large optics into them (without making them the size of a SLR) which was the general point I was making. So while I agree that its not all about megapixels I'd disagree about "no smartphone sensor comes close to even point and shooters" when in fact the same manufacturer's sensors can be found in both devices at present. A smartphone camera will never replace a decent camera (M43, MILC, DSLR etc.etc.) but they are having an definitely having a large impact on the point and shoot camera market. Or technology, and it will. Fair enough. I've seen too many people go the route of "this camera is better because moar megapixels", especially in the smartphone market where Apple and HTC held off the megapixel race and got uninformed criticism for being "only 4/8 megapixels". I may have projected that onto you. "Look, guys, I have no idea how camera lenses work!" Why do you think every smartphone has fisheye-type cameras? That's all they can do given the sensor size and the smartphone thinkness within which they have to position the lens. So unless you want borderline microscopic sensors that will have difficulty taking reasonable pictures in bright daylight while producing thumbnail-sized images, or you don't mind a >10 cm bump on the back of your smartphone, your smartphone is not gonna have telephoto lens, ever. Like Arris said, this is not constrained by technology, this is literally constrained by optical physics. To be fair when I read my post back that's how it read, my fault for not making it clearer. "I have more megapixels so its better!!!" is definitely a widespread problem. Then again most of the people shooting with only a smartphone only want selfies or snaps of their food to post on social media and have no other plans for the images. Have you seen this before? Wedding shot with an iphone ( https://fstoppers.com/wedding/entire-wedding-shot-iphone-and-processed-using-instagram-5286 ). Sure the composition, framing, lighting(in some) is decent but I still find the images flat/lacking contrast but that could be the editing to try and hide that lack of dynamic range. Oh, it's definitely the Instagram processing. Not that an iPhone would otherwise have spectacular contrast or dynamic range, but Instagram's 101 is some shadow save followed by a fade effect on the dark tones (which really flattens the dark areas of the image), and then different tints for shadows and highlights. It tends to crush some colours as well.